My family back home wonders what we do all day, and I know that it is a question that comes up with a lot of retired expats. What do you do all day? Well, this week was crazy! We arrived home from Puerto Lopez on Friday night. Saturday was spent just hanging out, cleaning and trying to catch up. On Sunday we had friends come and stay for the night. 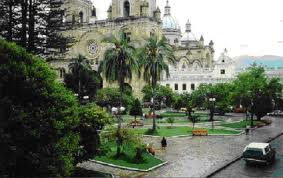 Jack and Andrea brought us, our dog and all our luggage from Quito to Cuenca upon our arrival in Ecuador. They do that for a lot of couples now, but we were the guinea pigs. When they bring down other families they always stay at our place. So, we had Jack and Andrea staying for the night. We also invited Bruce and Linda and Richard and Isabel over for dinner and drinks. Andrea brought a new friend with her, Enola Gay. She is half poodle/half pekinese. So cute. Only 5 weeks old. On Wednesday we were supposed to have Spanish class, but we had an opportunity to finally see the farm in Tortorillas that we wanted to see, so we took it. Fabi still came and taught Finn and Tali, but then she was nice enough to watch the kids while we went with Aaron and Brian, our friends and realtors, out to Tortorillas. The woman is selling 13 hectares (about 30 acres). There is about 4 acres pasture and the rest is forest (bosque). Thick forest. The hills roll so parts of the property are steep. You might recognize the area because this is where I go horseback riding. We found a place where we might put a house, but the logistics would have to be worked out. It is up on a plateau overlooking the valley. Gorgeous views. We would need to cut a road and we haven't gotten a clear answer as far as access and an easement. On Thursday Fabi called in sick, so no Spanish class. We headed over to a paper store that I have wanted to go to. I was looking for a calendar, but no go. I don't know where to get a calendar. Mark wasn't feeling well, so he headed home and the kids and I went to the market. Usually we buy our produce at Coopera (the organic market), but I haven't been happy with all of their produce. Some of it is okay, but a lot of it seems old. I brought my backpack and we loaded it with 2 pineapples, a big bunch of bananas, 6 pears, 6 oranges, a pound of strawberries, 6 chirimoyas and 5 mandarin oranges...$14. Not bad. 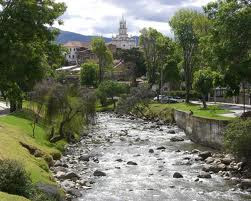 We had made plans with Aaron to go out to his house in La Jarata on Friday. We wanted to see the kind of construction his crew is doing if we were to choose him to build our house. We also wanted to see La Jarata. 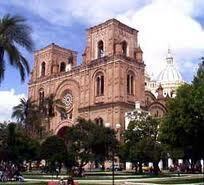 We had heard it was gorgeous, but also that it is much colder than Cuenca. La Jarata is about 50 min. from Cuenca, but on a really good road. It is also much higher than Cuenca at about 10,000 ft. The views are extraordinary and we were really taken with the area. It was a bit chilly at first, but we warmed up as the sun came out. We definitely noticed a difference in the temperature and altitude though. Aaron owns about 250 acres and his house is in the process of being built. They already have the stable up, as well as his guardia's house. We walked a big chunk of the property and contemplated where we might build a house and dairy barn. It is much drier at this altitude and a worry here is access to water and food for the goats. We would probably have to irrigate a portion of it and grow some of our own feed. Aaron is planning on an adventure/tourist destination on his farm. Hiking, horseback riding, ziplining, paint ball course, biking, etc... I know the kids would have a blast living here, but there are so many other considerations. Aaron, Mark and Bruce in La Jarata. horses and runs High Horse Breeding. Their beautiful home under construction. The view from their porch. A possible building site for us. view while you are milking! After we got home from La Jarata we hung out for awhile and then went to a going away party for the Manuel family. Tyler, Marvel and Greg have been here for 6 weeks visiting Chelsea and Brian. Now they are heading home to Tennessee. We went to San Sebas for dinner. There were around 22 of us, so we took up the whole second floor. We had a great time with lots of laughter. I really needed that. Yesterday we were supposed to go hiking on the Inca Trail with some friends, but I was feeling poopy so Mark went alone. Now I am kicking myself because I forgot it was the Vernal Equinox and the hike also included a shaman ceremony with food, music and dancing. The hike was in Cumbe and Mark got some stunning pictures. While Mark was hiking and getting blessed I started to feel better and in the afternoon made some coconut milk and energy bars. Apple Pie Caveman Bars. Yum! Today we went back out to Tortorillas with the contractor, Daniel. He was able to look at the site and tell us that yes, it is possible to build a house on the little plateau. Access is still an issue though. We really need to get a definitive answer on that. We figured out where we can build a dairy barn and milking parlor, and where the reservoir would go. Getting electricity to the property will be a hefty cost. We will also have to put in a road. After seeing the property again I felt really good about this area. As we were leaving we ran into the guardia for the notary's hacienda on the hill. (This is the hacienda where I go horseback riding.) He told Daniel that he thought there was another piece of property for sale in the valley as well. Daniel is going to call us when he gets more information. So, that might be another option as well. I couldn't NOT take a picture of the donkeys. Property starts at the second white fence and goes up the hill. Way in the back it goes left to another pasture. follows the roll of the hills to the right. Mostly forest. all the way into the forest. up to where we would consider building our house. built looking northwest through the valley. Looking ahead from the plateau. Looking down the valley from the plateau. Another picture of the narrow pasture in the background. you will see another pasture that is part of the property. a couple of crazy people. Our last day started out sunny and stayed that way. Finn and I went for our last morning walk. Then we spent the day at the beach with lunch in town. Finn and Tali built a ginormous castle with wall that was still standing even after lunch even though the tide had come in a bit. They were very anxious about it while we were eating lunch. More gorgeous pictures of Hosteria Mandala. I was very taken with the cute port town of Puerto Lopez. We ate at this restaurant, Dona Elsie, the night before. The food was delicious and the place was hopping. I had fish in coconut sauce and Mark had fried shrimp.